One of my favorite seasons has arrived—and may go away very, very soon! 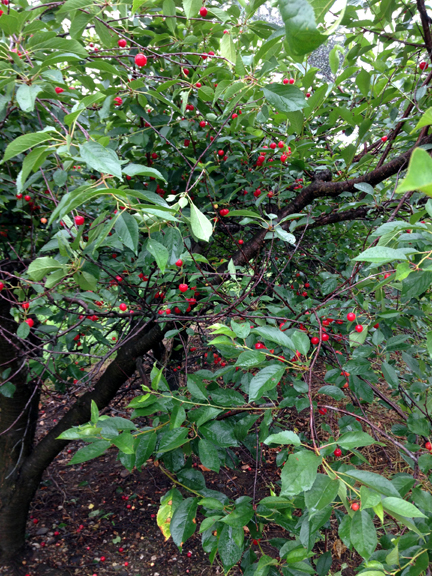 Sour cherries are ripe here in Franklin County, Massachusetts. This smaller, redder, tarter version of the conventional cherry is perfect for cooking. 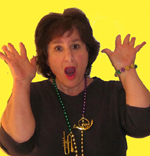 My mother used to make sour cherry soup. 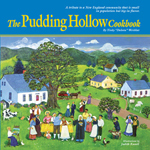 (I wish I had her recipe; I’m going to try to recreate it one of these days.) Sour cherries are great in pies, cobblers, cakes, and jams. They hold their shape well when baked. And when one combines them with sugar (as I’m afraid one pretty much always does) they deliver a succulent sweet-and-tart flavor that gives extra dimension to anything one creates. Ben Clark of Clarkdale Fruit Farms in Deerfield recently let me pick some of his sour cherries so I could experiment. Clarkdale isn’t open at this time of year, but it does sell its delectable cherries at the Greenfield Farmers’ Market on Saturday mornings. I ended up picking the cherries in the rain—but somehow the whole experience was still delightful! According to Ben, cherries were one of the first crops his great-grandfather, Dr. Webster Clark, planted when he started growing fruit more than a century ago. (Clarkdale celebrated its centennial in 2015.) Today the farm harvests varieties the Clarks have been growing over the past decade. Clarkdale harvests several hundred quarts of sour cherries a year. 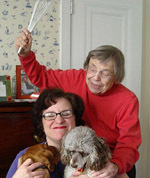 The varieties featured are Jubileum, Montmorency, and Balaton. I picked Montmorency cherries—sour but not too sour. The farm also produces six varieties of sweet cherries. 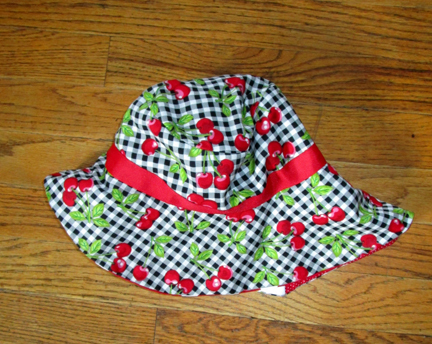 I even had a cherry hat to wear while picking, made by my cousin Kate! The bad news is that the sour-cherry season is short. The good news is that that season is RIGHT NOW. The tart cherries are worth embracing for that limited period of time. They don’t just taste good. They are good for those of us who consume them. Sour cherries contain something called anthocyanins. Linked to the bright hue of the cherries, these substances can help the liver, reduce blood pressure, lower cholesterol, fight arthritis, and improve circulation. Studies indicate sour cherries may even prevent cancer. 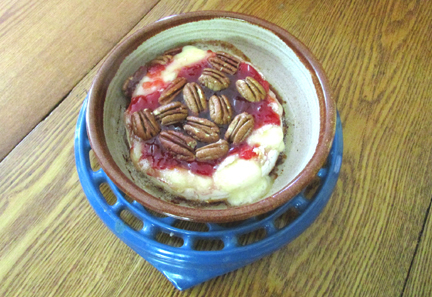 I also made an appetizer, baking brie with sour-cherry jam and pecans. I had been longing to bake brie ever since a friend gave me a handsome brie baker from local potter Jeanne Douillard. The baker worked like a charm, and the combination of flavors and textures was a winner. 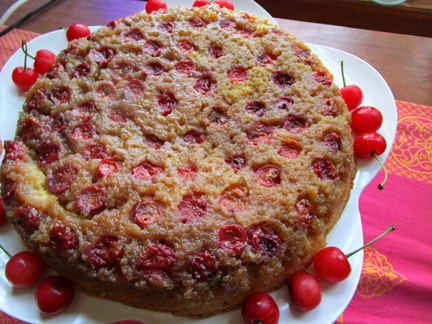 Finally, I prepared a cherry upside-down cake. This was more or less an accident! I had hoped to make a cherry torte based on a classic New York Times recipe. When my cherries slid ignominiously to the bottom of the torte, I took their descent as a hint that maybe I should try an upside-down cake. First, make the jam. (This may be done days in advance as long as you store it in the refrigerator.) In a medium saucepan combine the cherries, 1 cup of the sugar, and the lemon juice. Let this mixture sit for an hour or so to juice up. When the hour has elapsed heat the cherry mixture, stirring frequently. Once the cherries begin to soften, add the remaining sugar and the butter. Cook until the jam reaches a temperature of 218 degrees. Remove the jam from the heat and let it cool. To make the baked brie preheat the oven to 400 degrees. Slice the top rind off the brie, and place it in a lightly greased, shallow baking dish. Put the jam and pecans on top. Bake the brie until it gets oozy and warm. In my brie baker this took 25 minutes. I should think it would be done in 20 minutes in a thinner pan. Serve with crackers. Serves 6 to 8. First make the topping (which goes on the bottom!). Melt the butter in a 9-inch cast-iron skillet. Stir in the brown sugar and cook, stirring, until it melts and bubbles—3 to 4 minutes. Arrange the cherries on top. For the cake cream together the butter and sugar. Beat in the eggs, 1 at a time. Add the baking powder and salt. Stir in the flour alternately with the milk, beginning and ending with the flour. Stir in the vanilla, and pour the batter over the cherry mixture. Bake the cake until a toothpick inserted into the center (but not too far down; don’t hit the cherries!) comes out clean, about 40 minutes. If the cake is brown but not done before this happens, decrease the oven temperature and continue baking. Allow the cake to cool for 5 to 10 minutes. Loosen the edges with a knife, and invert the cake onto a serving plate held over the skillet. Turn upside-down. Remove pan. Serve alone or with whipped cream. Serves 8.